The Black Panthers were fully integrated into this cultural ferment, as well as being a bridge between the Old Left and the New Left. Panther stalwarts like David Hilliard worked the docks in the ILWU, Panther sympathizer -- and later a member of the House of Representatives from 1971 to 1993 and mayor of Oakland from 2007 to 2011 -- Ron Dellums' father also was a longshore worker in ILWU and his uncle was C.L. Dellums, the West Coast leader of the Brotherhood of Sleeping Car Porters. The railroad brotherhood started organizing the 1920s in the black working class neighborhood adjacent to the end of the transcontinental railroad in West Oakland -- the exact same neighborhood where the Black Panthers were born. Oakland is bordered by Berkeley to the north and directly across the Bay from San Francisco, which it is connected to the Oakland-San Francisco Bay Bridge. University of California in Berkeley students, who were mostly white, threw themselves into Civil Rights struggles in the early 1960s, which gave the Panthers many young, idealistic student and counter-cultural sympathizers in the town next door. 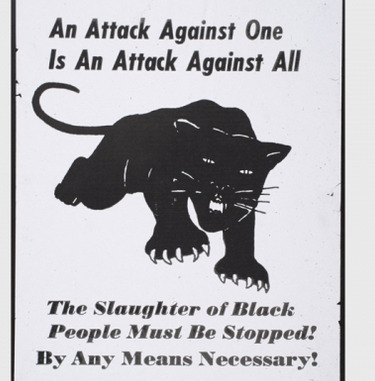 The anti-capitalist efforts of the Diggers offered many programs, like free food distribution, that the Panthers took up and emulated in black neighborhoods of Oakland. Yippie Stew Albert is credited with dropping off the first box of free food at the Panther office, giving them the idea (Albert also helped broker the bizarre plan where the Weather Underground broke Timothy Leary out of prison and smuggled him to Algeria, where he stayed with Eldridge Cleaver). After visiting the commemorative exhibit on the Black Panthers at the Oakland Museum, I was impressed how much it emphasized their lasting legacy, especially among African Americans today. Yet it accurately displays the effects of state repression -- through programs like COINTELPRO -- and the state-level strategy incarceration as part of government efforts at counter-insurgency. It is the latter that I will return to, showing its affect on my own political practice. The account of the attack on the offices of the Los Angeles branch of the Panthers, located at 41st Street and Central Avenue, by 300 cops in LAPD's SWAT team on December 8, 1969 -- coming just days after Chicago pigs and the FBI assassinated Fred Hampton. The pigs came armed with M16s, military gear and armored vehicles. The Panther repulsed the attempted raid, with thousands of rounds fired by both sides, for 5 hours, finally surrendering; this outrage set off rallies across the country involving thousands of people. Miraculously, no one was killed. What is left out of the exhibit is how Panther leader Geronimo Pratt used his extensive military experience, having been a soldier on two tours of duty in Vietnam, to fortify and effectively defend the L.A. Panther offices. And how COINTELPRO meddling led to faction fights within the Panthers, pitting supporters of Newton against those of Cleaver. Pratt was on the side of the latter, which led to him not having an honest alibi and being framed for a murder that put him in prison for 27 years before being exonerated. The stereotypical image of a Black Panther Party member was a young African American male carrying a gun. Although this reflects Party in its infancy, by 1970, women made up two-thirds of the Party's membership. Women were the heart and soul of the Party. They held roles in the Party equal to those of their male counterparts, including chapter leadership. The Panthers were uncompromising about self-defense and were the target of government repression--from both the FBI and local law enforcement. This combination created the impression with the public that the Black Panther Party trafficked in violence. An eventual split in the Party further muddled the waters as one side advocated armed insurrection, while the national leadership in Oakland [meaning Newton --H] emphasized community programs and electoral politics. These times were messy and complicated, and former Panthers freely admit having made mistakes. External pressures and internal strife cast a shadow on the Panther's legacy. This seems to be a fair appraisal, I only wish they could have taken it further -- with those rival accounts of what succeeded and failed with the Panthers. It would be great to have a balance sheet, in the Panthers' own words, but it would obviously reopen many painful wounds since much blood was shed and many lives were cut down due rivalries provoked by state infiltration. What was impressive were the displays describing how the Panther's breakfast program for kids eventually was adopted nationwide and became official policy in alleviating hunger among school-age students. But neither breakfast for children nor the grocery giveaways were conceived of as charity. Conversely, there was a focus on the health of black communities and these programs attempted to provide free and healthy food for the communities where there was a Panther presence. Today we call those neighborhoods that lack availability of affordable, wholesome and healthy options "food deserts." This was what the Panthers were fighting against. And that legacy lives on today in the continued struggle for those same demands, as well as free food distribution and urban gardens. But what impressed me the most was how the Panthers chartered buses to take family members to visit loved ones in far-off prisons. With the exception of San Quentin, the site of California's Death Row, most high security prisons are in rural and remote locations. This program was essential in keeping up the morale and spirits of not only jailed Panthers, but other non-Panthers who had relatives in prison. The Panthers organized branches inside San Quentin and other prisons, but that has been well documented in various accounts, like the first-hand Bad: The Autobiography of James Carr and the academic study The Rise and Fall of California's Radical Prison Movement, among many, many others. I guess the Sixties stopped when we stopped going to see the prisoners. By the mid-1970s, most of the social movements fizzled, yet countless comrades continued to rot in California's ever-expanding prisons. This was the legacy my comrades and I drew from the legacy of the 60s and the Panthers. Here are two examples from my own experience. The Prisons Literature Project (PLP) grew out of a backroom at Bound Together: Anarchist Collective Bookstore (founded in its present location and name in 1983) in San Francisco's Haight-Ashbury neighborhood. When I got involved in the early 1990s, it was still a project of Bound Together but had physically relocated to Epicenter Zone, a punk rock meeting space, record and 'zine shop, and performance venue. PLP's formula was simple: over the years word had gotten round to prisons across the U.S. that if someone wrote a letter to our address at Bound Together, we would send them books they requested -- if possible, and with similar topics if not. When the project was founded in the mid-1980s, PLP started collecting donated books -- from whatever source, whether individual donations or from the extras at the many Bay Area bookshops. That was never really the problem, what was most desperately needed were volunteers to read the letters, select the appropriate book, and then package them for shipping. Our biggest problem was financing the postage, since we often had a several month backlog of packages of books stacked up waiting to be shipped. Here's where someone hit on a brilliant idea: since the Haight-Ashbury post office branch was just down the street from Bound Together, we stored packed up books there. And through its ebbs and flows in the post-World War II period, the Haight neighborhood was a working class black neighborhood before its low rents and massive Victorian houses became a Mecca for flower children in the hippie explosion in the mid-1960s. But there were still some African Americans living there from the previous generation, as well as in the nearby in the Western Addition district which as the time was still predominately black and many people used the Haight post office. So one weekend, we put all the packaged books in a shopping cart and wheeled them down to the post office. We set up a small card table and piled the books on it, with a simple PLP logo taped to the front. Peopled tended to be curious at this strange sight, and on the way inside to mail their own letters and packages, asked what we were up to. We quickly explained the project and said they could help by grabbing a packaged book and going inside and paying for the postage. It was amazing how sympathetic people became; we weren't asking for money, we were asking them to do a simple act of mutual aid. Many of the black people who agreed to participate browsed though the packages, looking at where they were addressed to go, and picked someplace they knew and told us they had a relative locked up there. We then had great conversations about prisoner support and the ways all of us could be in solidarity. Some went inside the post office and got such a deep sense of satisfaction at doing something so concrete to support prisoners, that they came back out and grabbed another package and went back inside to wait in line again and mail it. Others came back out and grabbed some fliers aimed at prisoners and said they'd mail them with letters they were going to send incarcerated friends or family. We cleared off the table of all the packaged books before we knew it and ended that activity with an almost euphoric sense of satisfaction at having hit on such a good strategy to engage people and have them materially support the project. It left us smiling and nearly everyone who talked to us and helped mail some books parted ways with us with emphatic expressions of gratitude for what we were doing, as well as cheerful smiles on their faces too. I only participated in the post office efforts a few times, and when Epicenter Zone closed, the project was homeless for a while before relocating to the Grassroots House across the Bay in Berkeley (also location of the local IWW branch, Copwatch and other groups) where it still continues today. The second Panther-esque prisoner solidarity action was at Santa Rita Jail in around 1992, the main jail for Alameda County (serving Oakland, Berkeley and other cities) where the Black Panthers often served sentences under a year (if longer, they were sent to state prisons). One of our comrades was in Santa Rita, with excessively high bail that we couldn't afford, awaiting trial. So we decided to visit her by carpool, but since several in our travel party were active in Food-not-Bombs, we cooked up a meal at one of the F-n-B houses which was an old Berkeley hippie commune and our older friend there had a catering business with especially good food (the F-n-B fare could, at times, be pretty bland and tasteless). This meal was exceptionally good, with various dishes carefully prepared from organic and fresh ingredients, and we brought it to the jail by car. Once at Santa Rita Jail, we threw several large blankets on the lawn, under a tree, next to the path from the parking lot to the visitors entrance. We set the food on a table and had musical instruments spread around on the blankets. Once we got set up, someone strummed a guitar, and we greeted the solemn visitors with a smile and invitation to join us for some food. Most took note, but headed into the jail to see friends or family locked up inside. Some came back out, got a bite to eat, thanked us, and started talking. It was like a therapy session, with so much pain as families are harmed so much when a family member is taken away and put into the jail/prison system. We explained the plight of our comrade, and got consoled ourselves. Some even took up a guitar and played songs they knew, which was touching. As our informal party attracted more people, others noticed and asked us what was going on while on their way to the visitors area, and immediately sat down and joined us. As I said, the food was great, and it was like an extended support group for those affected by being close to someone locked away by the state. It was that simple, but there's something about sharing stories and experiences that touches on something much deeper. Most visitors to the jail arrive glum-faced and leave even more glum-faced, knowing their loved one wasn't going to be free anytime soon. With our intervention that day, many left with smiles instead. But we also left with smiles on our faces and with the satisfaction that we touched the hearts of others, but that this feeling of emotional mutual aid was reciprocal. We felt a little less depressed about the ordeal facing our own friend who was in Santa Rita. Unlike the Panthers, we had neither the resources nor the community connections to charter buses to take people to visit prisons. So we took our solidarity action to the prison itself. And because of the legacy of the Black Panther Party, we learned the lesson that the movement stops when we stop going to see the prisoners. That was as true in the 60s as it is today. I guess the Sixties stopped when we stopped going to see the prisoners." Only just got round to reading this I'm afraid, so just to say great piece!